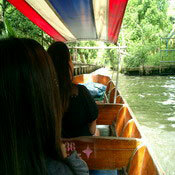 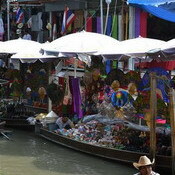 Waterways have always been an integral part of Thai life and many communities depended entirely on them for their daily existence. 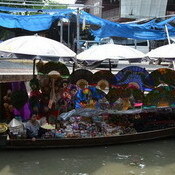 Long before cars, boats of all shapes and sizes plied the rivers and canals through the kingdom of Thailand, trading their wares and delivering their supplies. 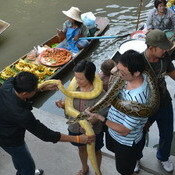 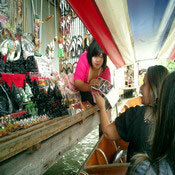 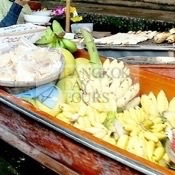 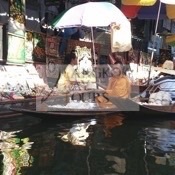 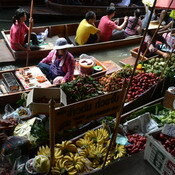 The Floating Market at Damnoen Saduak is located in Ratchaburi Province which is just over 100 kms or two hours drive from the capital city of Bangkok. 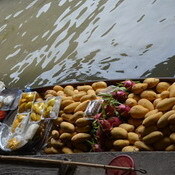 This is a particularly fertile area, being irrigated by a 32 kilometre straight-line canal constructed by King Rama IV way back in 1866. 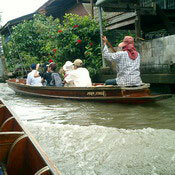 It connects the Taachin River with the Mae Klong River and became a major transport artery between the provinces of Samut Sakorn and Samut Songkram. 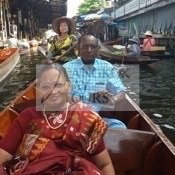 Apart from providing transportation, Damnoen Saduak Canal also provides year-round water, with more than 200 small canals having been dug by farmers to irrigate their land. 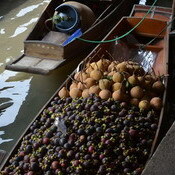 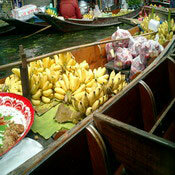 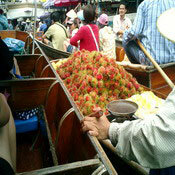 The area is famous for the quality of its fruit, namely grapes, mangoes, bananas, oranges, papaya & coconut. 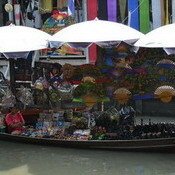 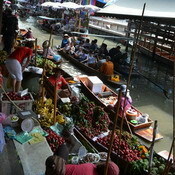 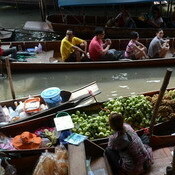 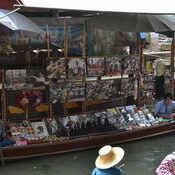 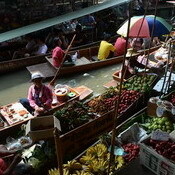 Nowadays, both sides of the canal are densely populated and bright and early every morning vendors from the surrounding area turn up to trade their wares.